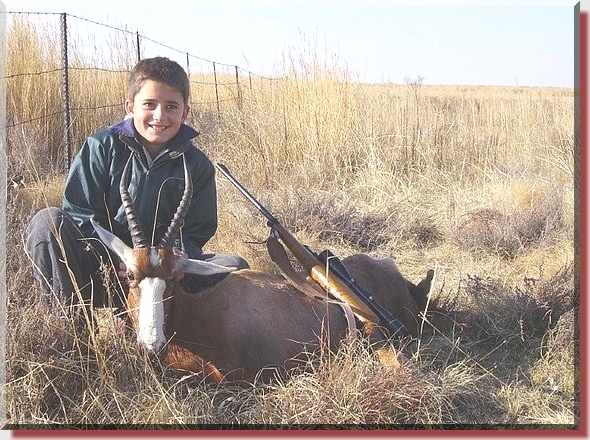 The blesbuck below was shot by my son, Hardus. Bullet drop: 110mm or 4.3"
the shoulder. The bullet perforated the sternum, bottom part of the heart, the left shoulder and was not recovered. The bottom two thirds of the shoulder, where the bullet exited, had meat damage. To my mind:  UNBELIEVABLE, but the adage "Seeing is believing" comes to mind. I will certainly be replacing all the bullets on my reloading bench with GS Custom HP and HV.